Named for its nearly-black, Brazilian-grown Arapiraca wrapper leaf, the CAO Brazilia is a powerful beauty of a smoke. These cigars are as well-presented as any other CAO line, and feature bold, pronounced notes of coffee, dark cocoa, cedar, black pepper, and leather. Expect a smooth, robust smoking experience, which will be made effortless by the Brazilia's phenomenal handcrafted construction. For a strong and delicious smoke that stays enjoyable from start to finish (and won’t empty your bank account), try CAO Brazilia. A wonderful smoke for a great price and add the service of your Best Cigar Prices and you are set for a wonderful experience! Had ordered another product which was unsatisfactory. BCP.com replaced with this no questions asked. Excellent choice. Smooth, medium-bold. A pleasurable smoke start to finish. 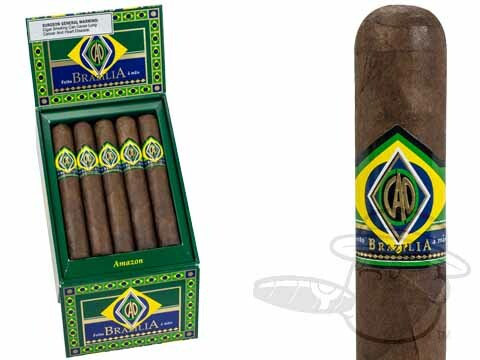 CAO Brazilia Amazon is rated 4 out of 5 based on 5 customer ratings.